I am so excited to offer my Hermetic Principles Month of Magic: Vibration set – the third set of seven on our journey through the great Hermetic principles or laws, the teachings of Thoth, god of wisdom, magic and writing. Thoth is also known as Hermes or Mercury. The Hermetic Teachings are secrets believed to have originated from the Emerald Tablet in ancient Egypt. Today, they are published in the book “The Kybalion”. These secrets are like doorways into new ways of thinking, being, and acting that allows us to work with energy and transform our lives. Just as the alchemists of old, we too can create and transmute matter. Matter is densified Spirit. Spirit is eternal and unchanging, but its forms are forever changing and transforming. 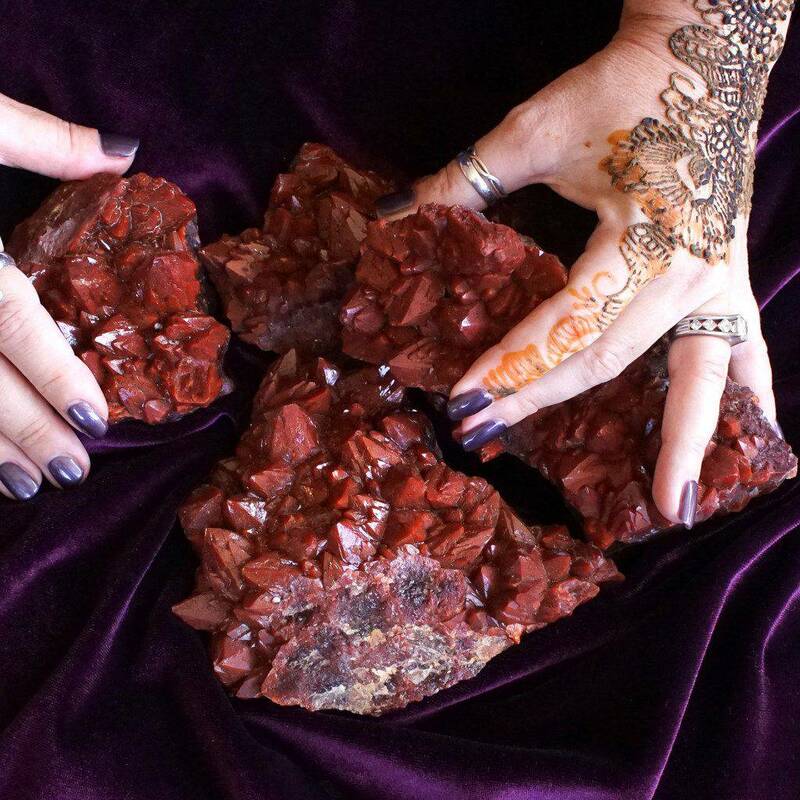 This magic is not reserved for the elite or spiritual guru – it is for anyone who chooses to learn and harness the language of energy. My third Hermetic Principles set is dedicated to the third Hermetic Principle, Vibration. The Principle of Vibration expresses the idea that everything is in constant motion, whether or not the motion is perceived. Everything, including thought, emotion, reason, and desire has vibration. The only thing distinguishing one form of manifestation from another (matter, energy, mind, and spirit) is the difference in vibration. Vibration rates and modes vary. Spirit has the highest frequency (imagine a wheel turning so rapidly it appears to be still). And at the other end of the scale, form with super low vibrations can also seem to be at rest. In between the highest and lowest, there are millions of varying degrees of vibration. The mind can be transmuted from vibration to vibration. Imagine heat. Hot and cold are degrees of the same thing and we all have experience changing the thermostat setting. We can reproduce mental vibrations, just like recreating color and sound. Reaching higher vibrational levels and different degrees liberates certain forms of energy from their confinement of molecules, atoms, etc. Mastering the Principle of Vibration is said to allow one to control her own mental states and moods and those of others. You can create your mood and polarize your mind any way you want. Those who have learned to change the vibrations of energy forms are said to perform “miracles”. First in this set is one (1) 6 oz hand poured Vibration Candle anointed with my Vibration Perfume. As you light this candle, allow your awareness of motion to arise. Think about how you want to feel and let this feeling build – imagine it swirling within and around you. Let other thoughts come and go, as if floating in the breeze. Do you feel the vibration of this feeling you really want? You might recreate a moment from the past when you felt this way. Don’t get stuck in the story attached to this feeling – just embody the feeling. Once you’ve learned its frequency, you can choose this vibration and state at any time! 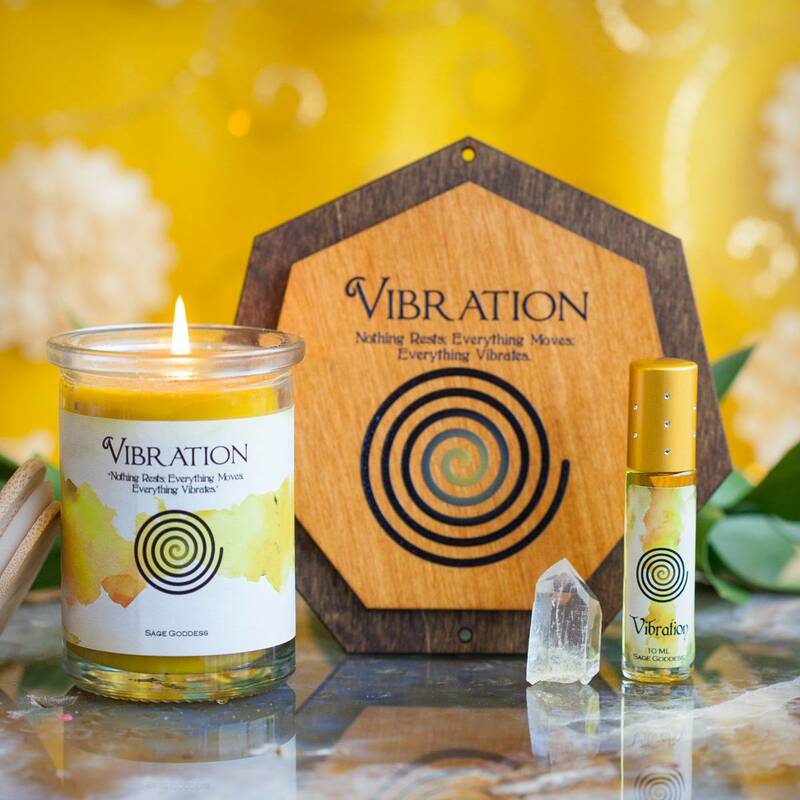 After that, you’ll receive one (1) 10 ml bottle of my Vibration Perfume, created especially for this set – to help you liberate yourself through mental transmutation. 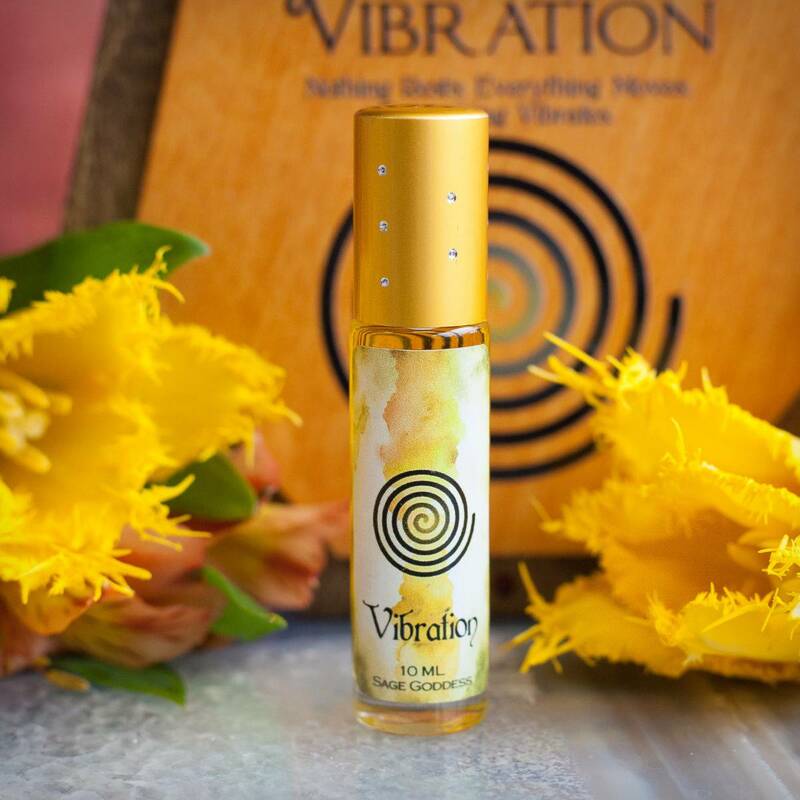 With notes of lemon, basil, thyme, and rose attar (the highest vibration of all essential oils), this blend will raise your vibration and support you in completely recreating your experience of reality. Next, you will receive one (1) wooden heptagon (about 6”), printed with an image of a sacred spiral with the words “Nothing rests; everything moves; everything vibrates”. Each month, a wooden heptagon will be included in the Month of Magic set. 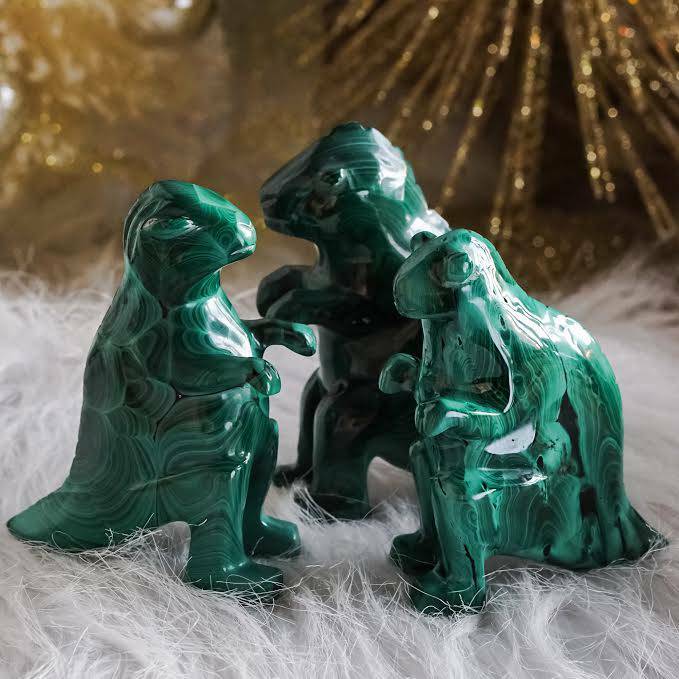 You’ll want to collect them all because together, they connect into an amazing piece you can hang on your wall. 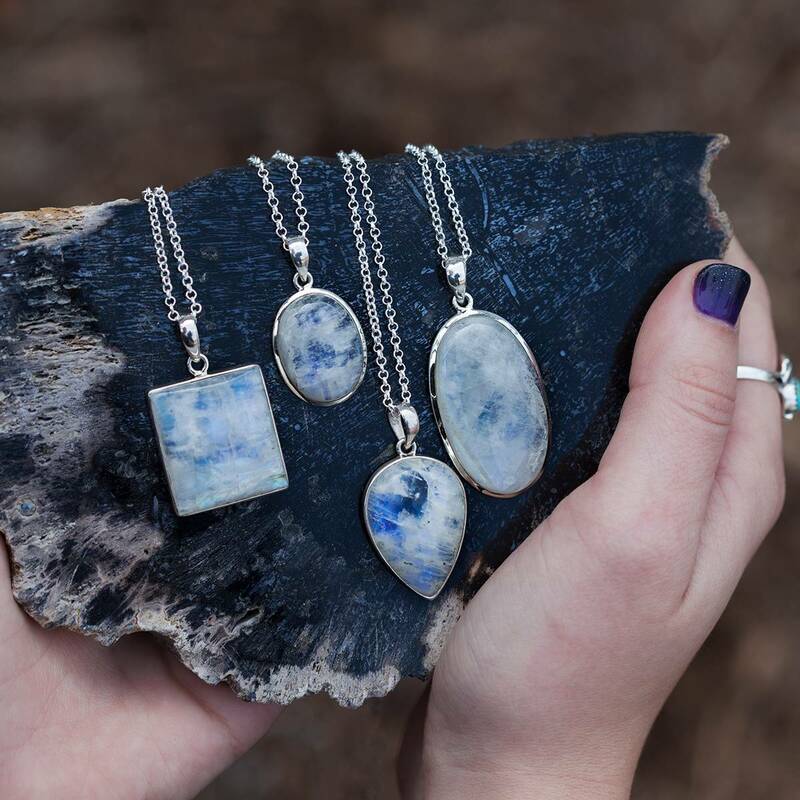 We are so excited to offer this one of a kind collection. Next, you will receive one (1) clear quartz point (about 1.5”) to draw in and amplify high vibrations. Clear quartz is the gem of magnification, intensification, and sealing of spells or intentions, highly adaptable to any magical purpose. Use your clear quartz point to amplify the properties of other stones and to connect with Spirit. Clear quartz is associated with the 8th, or Soul Star Chakra – the portal to the Higher Realms through which very high-frequency light can enter our etheric field. And lastly, you will receive one (1) beautiful journal prompt page, printed on parchment paper. Use this page to write down your thoughts, and feel the power they hold when taking form as written words. 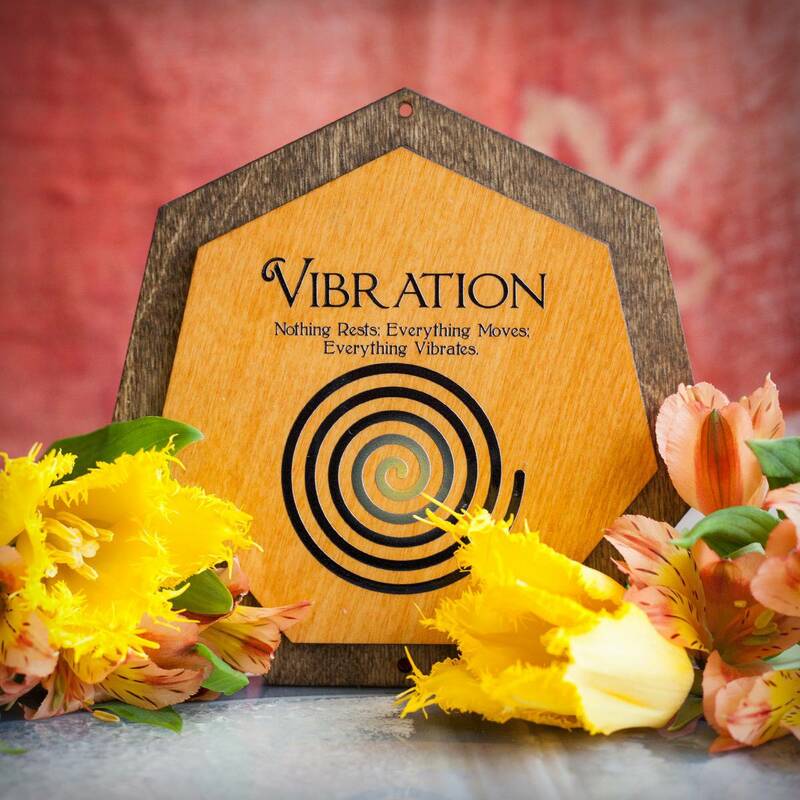 This page was created to prompt you to incorporate the Vibration principle in your own life. ***Note: This product is made with natural essential and carrier oils. Cap color, chip stone, and color may vary slightly. For external use only. This listing is for one (1) Hermetic Principles Month of Magic: Vibration set as described above. Yours will arrive lovingly parceled for your enjoyment.